If you’re passionate about UX and want to learn about it on a bigger scale, we’re getting ready to rock your world! 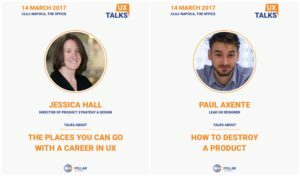 We’ve invited our Director of Product Strategy & Design, Jessica Hall (US), and our Lead UX Designer, Paul Axente (RO), to talk about what they know best: User Experience, Design & Product Strategy. 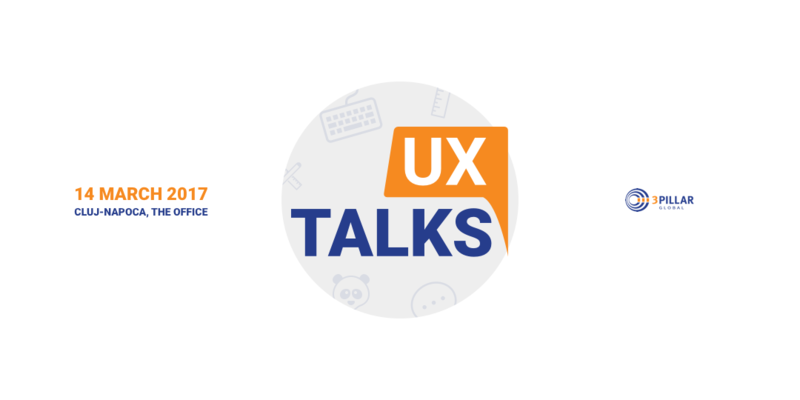 The event is for designers and developers, UX practitioners, and anyone looking to learn more about User Experience. The talks will be followed by a hands-on experience (workshop) where we will take a bad example, and together, turn it into a good one. We will conduct research, brainstorm, find solutions, sketch and present the results. Hopefully, you will get to experience a day in the life of a UX Designer, our style! Join us on Tuesday, 14 March at 6 pm, in Cluj-Napoca @ The Office, Building A, Ground Floor, Conference Room C.
Jessica Hall is the Director of Product Strategy & Design at 3Pillar Global. She helps clients build great products by defining their vision, focusing efforts and engaging with their customers. Previously she built the UX team at CEB and led the creation of the Newseum’s interactive exhibits and website. She has contributed to Mind the Product and Technical.ly and blogs at Hallway Studio. Her work has been recognized by the Web Marketing Association, American Association of Museums, The Webby Awards, Time and Forbes. Jessica holds a Masters in Design and Digital Media from the University of Edinburgh and a BA in Journalism from American University. Graphic design, UI design, and visual design are just a few of many ways you can use your creativity and skills to improve lives, grow businesses and have a rewarding career. In this talk, I’ll share my own career journey, share what new opportunities are in the market and give some advice on how to influence and create change in your organization. Paul Axente is a Romanian UX Designer raised in the heart of Transylvania and living in Cluj-Napoca. Over the years, he has had the privilege of working with companies such as The Telegraph, Carfax, CardConnect & more. Founder of #UXCT, a Meetup group where UX designers can sit down and share war stories. Currently working as Lead UX Designer at 3Pillar Global. Products, regardless of platform (mobile or web), are dangerous – they enable people to interact with each other, express their feelings, meet with friends or help them through the day. This, ladies and gents, is a bad thing and therefore they must be destroyed. I will show a few tricks which you can employ to destroy products. Grab the opportunity to meet them and save your seat now!